Long after we added Romanians, Slovaks, Peruvians, Luxembourgeoise and Hyderabadis to the Panzer Grenadier system, we finally have some substantial Canadian content. 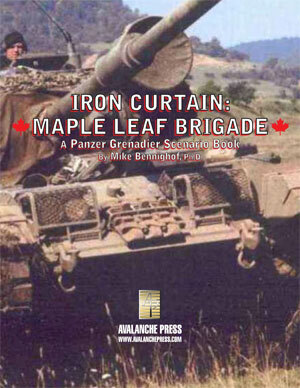 Iron Curtain: Maple Leaf Brigade is a supplement looking at Canada’s crack Brigade Group deployed in Germany during the Cold War. It includes 88 new silky smooth, die-cut-and-mounted pieces all depicting Canadian troops, vehicles and weapons. Plus there are ten new scenarios for their use and two new battle games linking the scenarios together in a campaign format. It’s a tightly-focused package, and came out pretty much the way I hoped when designing it. The Canadians are very good, with strong leadership, high morale and usually an edge in initiative, too. In terms of quality, the brigade is closer to the Canadian Army that went to Europe for the First World War than that which reported for the Second. All personnel had volunteered, and many had seen action in World War II or Korea (or both). The brigade was expected to act as the British Army of the Rhine’s “fire brigade,” and that is what they do in the scenarios. The story line follows what NATO expected to face: a massive Soviet attack aimed at the industrial centers of the Ruhr valley. The corps-sized British Army of the Rhine stood in their way, aided by some defensible woods and hills. The Canadian brigade would plug any holes in the British line, or spearhead counter-attacks. Or it might be shifted to support adjacent American and Belgian units as needed – the Canadians had stipulated that the brigade must be deployed as a whole, but could serve anywhere within the NATO area. In the scenarios of Maple Leaf Brigade, the Soviet attack on West Germany begins in October 1951, and is assumed to be taking place alongside the operations described in our Iron Curtain: Hammer & Sickle book. In the first chapter of our Maple Leaf story, the Third Shock Army pushes across the border and meets the defending British Army of the Rhine. The Canadians are thrown into the fiercest fighting, and experience many types of combat: positional defense, screening the BAOR’s retreat, counter-attacking or in meeting engagements. They usually are facing the Soviet 10th Guards Tank Division (pretty good) or the 207th Motor Rifle Division (not so good). The first five scenarios make up the story’s first chapter, showing the Canadians during this defensive phase, and they’re linked together in a “battle game” like those in most of our more recent Panzer Grenadier offerings. You play all five scenarios, and then see if you can meet the battle game victory conditions as well. The battle games give the scenario set structure that helps reinforce the narrative, and they don’t add complicated extra rules. They make the game more fun. The second five scenarios are, likewise, a separate chapter, picking up immediately after the end of the first. The BAOR is on the counter-offensive, with the Canadian brigade in the lead. The Canadians have restocked their weaponry and added more Centurion tanks plus Hoverfly helicopters for spotting tasks. The Centurion is a fine tank, though it is pretty slow, and with Canadian crews it is a potent weapon even against the new Soviet T44 medium and JS3 heavy tanks. The second chapter has its own battle game calling the Canadians to attack and press the Soviets back into East Germany. The Soviets deploy their armored reserves to stop them, resulting in some mobile tank battles. And once again there’s a battle game to link all five scenarios together. The Canadian brigade (officially at this time the 27th Infantry Brigade Group) was a balanced all-arms mechanized force, sometimes referred to as the “Canadian light division.” The striking power at first lay in the three infantry battalions; when the Americans could not provide M3 armored halftracks for them the Canadians at first mounted them in trucks and then switched to Kangaroo fully-tracked armored personnel carriers taken from World War II-era stocks. The Kangaroo was a Canadian conversion of a medium tank (M4 Shermans, Canadian-made Ram tanks, or the Canadian-made Grizzly tank, a slightly modified Sherman). The game treats them all the same, and they are an enormous advantage for the Canadians. They can go anywhere a tank can go, and they have a tank’s armor protection – not a very good tank compared to the T44, but a tank all the same. The standard Canadian anti-tank gun is the powerful 17-pounder, designed in the late stages of World War II as a counter to the huge German Panther and Tiger tanks. It’s pretty potent against the big Soviet tanks as well, but the Canadians were provided only with the towed version and not the self-propelled Archer and Achilles tank destroyers (though Canadian units had used them during World War II). In a hot war the Canadians probably would have eventually received them; BAOR units still had the Archer during this time period. Canadian support weapons, by contrast, are pretty weak. Denied the American weaponry they had planned on taking to Europe (most of that was on its way to Korea), they had the British 3-inch mortar rather than American-made mortars and recoilless rifles. The Vickers machine gun remains a reliable weapon and the machine gun platoons are strong; the rifle platoons are hampered by the small size mandated by their British-inspired organization. Those Centurion tanks make up for a lot of other shortcomings. They sport the 17-pounder as their main armament (this is the Centurion I model; later marks would carry even more powerful guns) and have good armor. Their speed is not so good; the Canadians will not be zipping about the battlefield. The brigade starts out with a single company (“squadron” in Commonwealth parlance) later raised to a battalion (“regiment”) in size. Historically this did not happen until some years after our period, but historically, there wasn’t a shooting war going on in 1951, either. Once the Canadians field their full allotment of Centurions supported by tough Kangaroo-mounted infantry, they are a very formidable combination. We’ve been making really good stuff lately, and I’m pleased with the tight focus of Maple Leaf Brigade’s story arc, and it has a nice set of pieces to go with it. It’s good to get products like this, originally a special “enhancement” produced just for the Gold Club out to a wider audience. Don’t wait to put Maple Leaf Brigade on your game table! Join the Gold Club and find out how to add it to your collection!